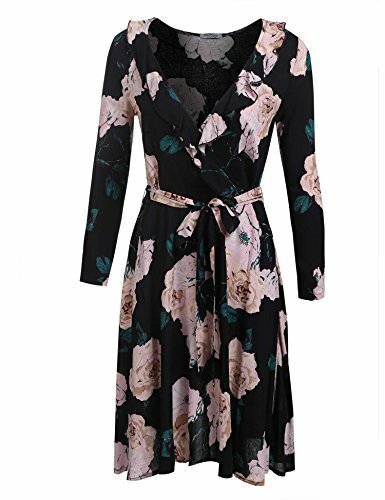 the printed floral dress is midi length, it's perfect for formal, wedding guest, wedding party, cocktail, wear to work, casual etc. A cute summer shift dress which is perfect for any occasion! V neck, Floral print, ruffles neck, with pull on closure, Bohemian long sleeves short dress, Casual swing dress, unlined. Shopping Guide: S=US 8; M=US 10; L=US 12; XL=US 14. XXL=US 16, The Bust size fit in: S:34.0", M:37.0", L:39.0", XL:40.9", XXL: 42.9" is very important. Garment Care: Hand wash and hang dry , do not bleach. High quality soft fabric. Please iron if wrinkled. There are 5 size (S,M,L,XL,XXL)available, Please refer to sizes in Product Description carefully before purchasing. -A well-made side zipper high waist full length lace patchwork dress. Navy Blue, Wine, Black 3 color, S-XXL 5 size, you can choose. -Fashionable v-neckline and swing design make you more charming. -Basic and stylish outfit, Vintage style, suitable for casual or party wear, suitable for any season any occasion. - A must have casual floral chiffon lace dress. You come to the right store, we always provide the unique design dress. According to the light and different computer monitors, the color may be slightly different as pictures show. Besides, please allow 1-3cm error due to manual measurement. Your understanding and support are highly appreciated.